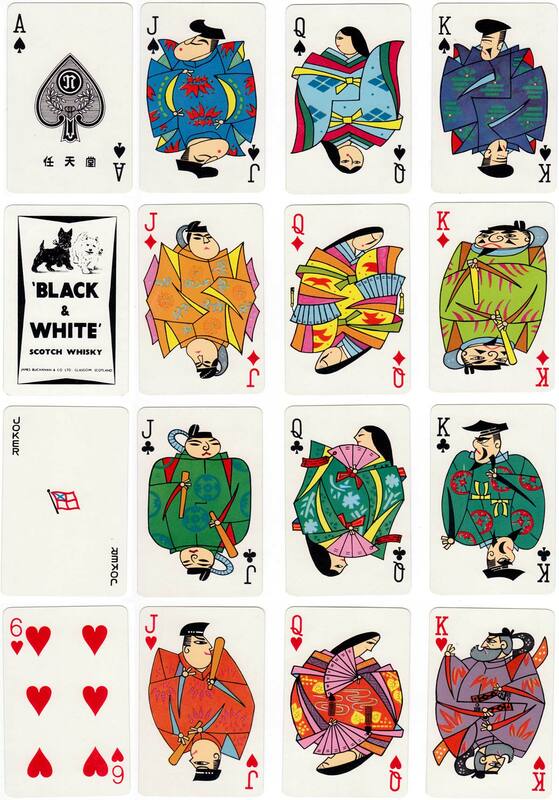 These stylised and very colourful Japanese playing cards, advertising ‘Black & White’ Scotch whisky, were made in Japan by Nintendo Playing Cards Co Ltd for Dodwell & Co. Dodwell’s was a leading British merchant firm in China and Japan during the 19th and 20th centuries. The Dodwell & Co flag appears on the Joker. The ‘Black & White’ blended Scotch whisky brand’s motif, featuring a black Scottish Terrier and a white West Highland White Terrier, was conceived by James Buchanan during the 1890s. Nintendo sold playing cards in all sorts and sizes, from mini to oversized, and was the first in Japan to begin manufacturing plastic-coated cards. Nintendo was founded in 1889 and produced hand-crafted playing cards. Today it is better known as manufacturer of the Wii U console and Nintendo 3DS & 2DS systems. Above: ‘Black & White’ Whisky advertising playing cards manufactured by Nintendo Playing Cards Co Ltd for Dodwell & Co., 1960s. Images courtesy Rex Pitts.